Going on a camping holiday? If rocky coastlines and big seascapes are your thing, Pembrokeshire is your place. Almost the entire coast is a National Park and campers will find a holiday destination with stunning cliffs, mellow coves and fantastic surfing beaches. The sprint to the beach is sometimes good reason to camp a short step inland where the lush scenery and quaint market towns provide an equally good location for campsites. Whatever you’re looking for in a holiday, Pembrokeshire will have it covered. It's time to jump in and start planning your adventure! The remote beach at Barafundle Bay is not the largest in Pembrokeshire but it is one of the most well known. Backed by dunes and pine trees and only accessible via a half-mile walk, its detachment from the outside world is part of the appeal. There's a number of excellent campsites nearby, the best of which have made our shortlist. Just inland but on the edge of the Pembrokeshire Coast National Park, the pretty village of Crymych has something for everyone, with the beaches of the coast nearby and the hiking haven of the Preseli Mountains on the doorstep too. Discover the best local campsites with Cool Camping's hand-picked collection. Set in the Gwaun valley, where the river meets the sea, the pretty fishing village of Fishguard in Pembrokeshire is ideally situated for seaside breaks, with plenty of local campsites nearby. So, whether you want to trek to Strumble Head or spend a day sea kayaking from beach to beach, find the best Fishguard campsites here. Pembrokeshire's county town and a hub for any campers on their way to the coast, Haverfordwest is at the very heart of the Welsh county and an ideal focal point on camping trips. There are plenty of good campsites in the local area, with the best of them making it into the select Cool Camping collection. The north Pembrokeshire village of Letterston is well placed for camping holidays, tucked slightly inland, away from the busier tourist areas along the coast, but within easy range of Fishguard, St Davids and Haverford West. There are many good campsites in the local area, the best of which can be found in our curated collection. The pretty fishing village of Little Haven, on Pembrokeshire's west coast, is a transformative place. At high tide, water ripples at the bottom of the village, but at low tide a beach appears, with rockpools to explore and starfish scattered about. There are plenty of campsites locally and, as always, we've picked out the very best of them. The seaside village of Manorbier in Pembrokeshire has it all; a Norman castle, a beautiful, sandy beach, a clutch of good pubs and cafés and a trickling stream that bubbles its way down to the sea. There are ample local campsites to choose from and we've been checking them out in order to bring you a collection of the very best. Set along the banks of the Milford Haven estuary, with a sheltered, natural harbour, the charming Pembrokeshire town of Milford Haven welcomes campers with gusto, offering everything needed for a summer holiday on the coast. We've been our and about in the local area finding the very best campsites for our collection. With a museum, gallery, food festival, farm and a range of independent shops and eateries, the inland town of Narberth, in Pembrokeshire seems to have it all. And, as with all good locations, Narberth is dotted with local campsites too, only the best of which make the cut for our Cool Camping collection. At the northern end of St Brides Bay on the Pembrokeshire coast, the seaside village of Newgale enjoys access to some three miles of beautiful sandy beach. Within the Pembrokeshire Coast National Park, the area is awash with good campsites and there are plenty near Newgale to choose from. The north Pembrokeshire village of Newport, at the mouth of the River Nevern, is set within the Pembrokeshire Coast National Park and directly on the Pembrokeshire Coast Path. Unsurprisingly, the fishing village is a popular focal point for campers, with all the amenities needed and plenty of good campsites nearby. Overlooked by Pembroke Castle and still featuring its historic town walls, Pembrokeshire's county town is an ideal centre point for any camping holiday. 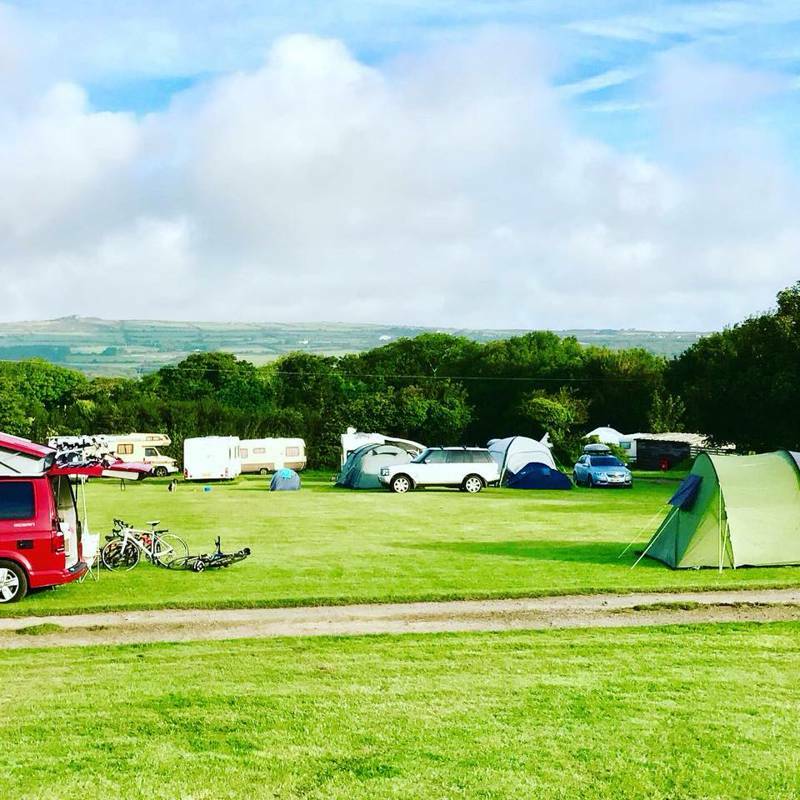 Set along the the Daugleddau estuary, the local area is awash with good campsites and offers both spectacular countryside as well as easy access to the coast. Set around the beautiful, sandy sweep of Saundersfoot Bay, the village of Saundersfoot is one of the most visited camping holiday destinations in all of Wales. In the countryside beyond, there are heaps of campsites to choose from, with the very best of them making it onto the Cool Camping shortlist. Which will you choose? On the banks of the River Alun, the tiny city of St Davids is little bigger than a village and can be explored – from cathedral and ruined Bishop's Palace to cafés, pubs and shops – in a short weekend. 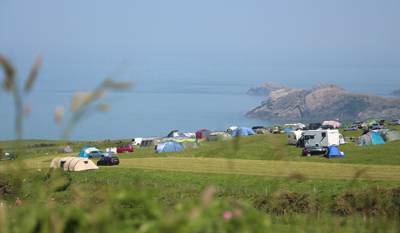 In the local surroundings, spilling out to beautiful beaches and bays along the Pembrokeshire coast, there's a wealth of good campsites to choose from. Perhaps Pembrokeshire's best-known seaside town, Tenby offers blue flag beaches, a mighty castle and boat trip to Caldey Island. Every bit of the place deserves to be explored and it's a rightfully popular spot. The surrounding countryside is peppered with good campsites and we've been out in the campervan picking out the very best. Whether you're a camper or a glamper, nothing beats kipping under the creamy canvas of a bell tent. 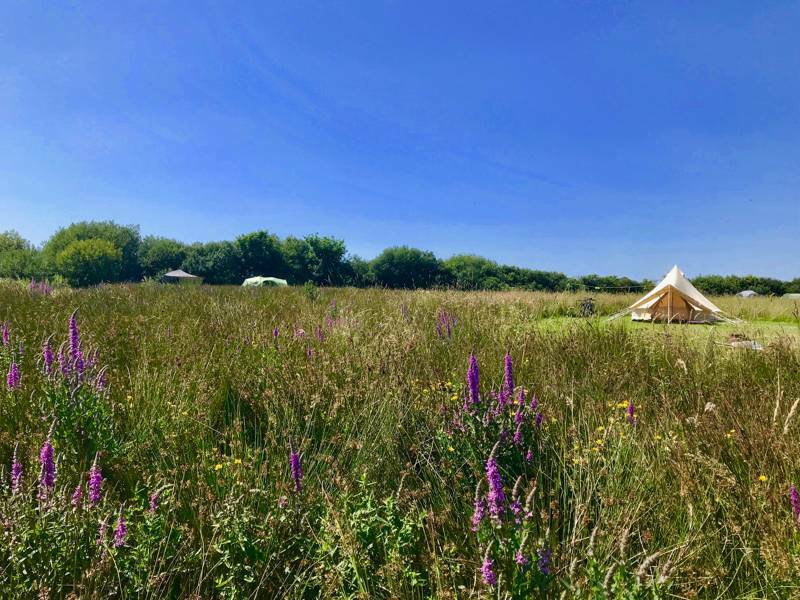 Leave your gear at home and rent a bell tent at one of these incredible locations in Pembrokeshire, all independently run and hand-picked by the expert travel team at Cool Camping. Going camping in Pembrokeshire? Don't leave your best friend at home. Sniff out the latest dog-friendly campsites and get your paws into the latest pet-friendly stays in Pembrokeshire with this hand-picked collection of the very best campsites where dogs are welcome too. 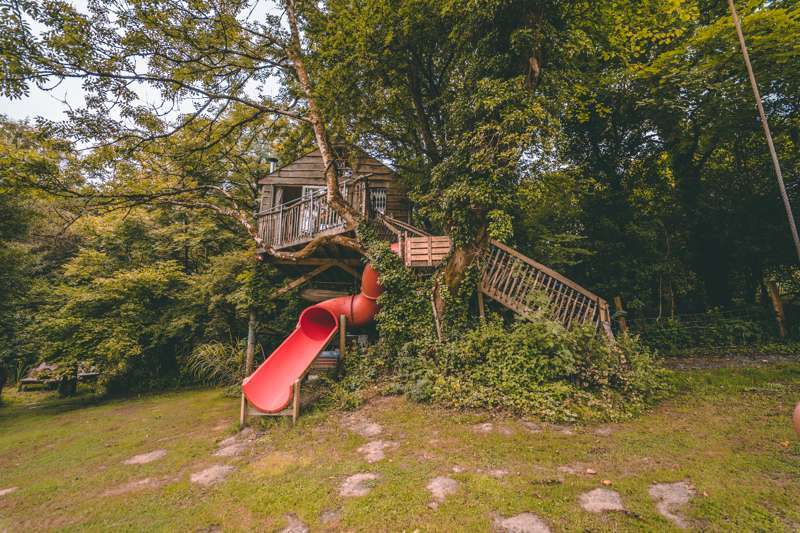 Throw a frisbee, clamber on a climbing frame or hunt for Welsh dragons in an enchanting wooded dell, discover the best campsites for kids with this hand-picked collection of family friendly campsites in Pembrokeshire – all independently run and specially chosen by the Cool Camping experts. Whatever the weather, enjoy a glamping break in Pembrokeshire in style with a sturdy stay inside a glamping pod. 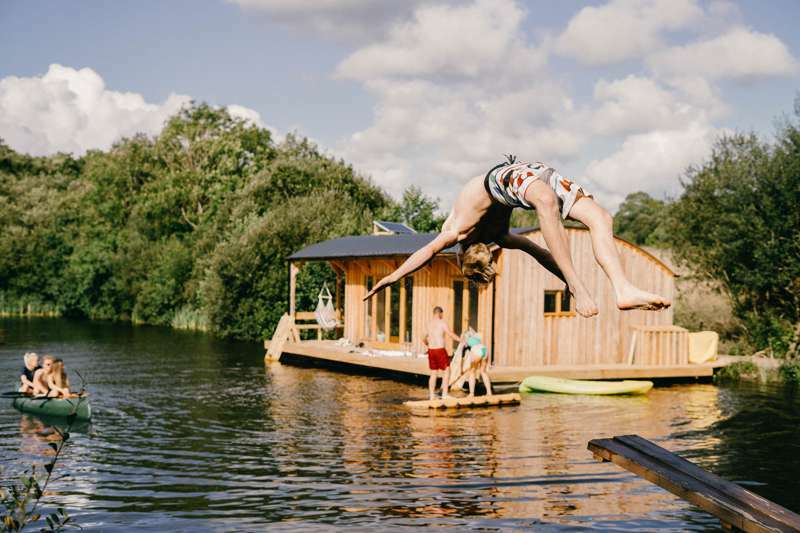 Discover the best pod locations in the country with this hand-picked collection of the best independently run glamping sites, all chosen by the travel experts at Cool Camping. Snuggle down in a shepherd's hut and enjoy glamping in Pembrokeshire whatever the weather, with this stunning collection of the glamping sites. Discover the best shepherd's hut locations in the county, all hand-chosen by the award-winning travel team at Cool Camping. Fancy a glamping holiday in Pembrokeshire? Now yurt'alkin! Discover the cosiest yurt locations in the country with this hand-picked collection of special places to stay, all chosen by the award-winning travel experts at Cool Camping. Pembrokeshire is home to one of the best beaches in the world, the nation’s only coastal national park and one of the greatest long-distance walking paths on the planet. 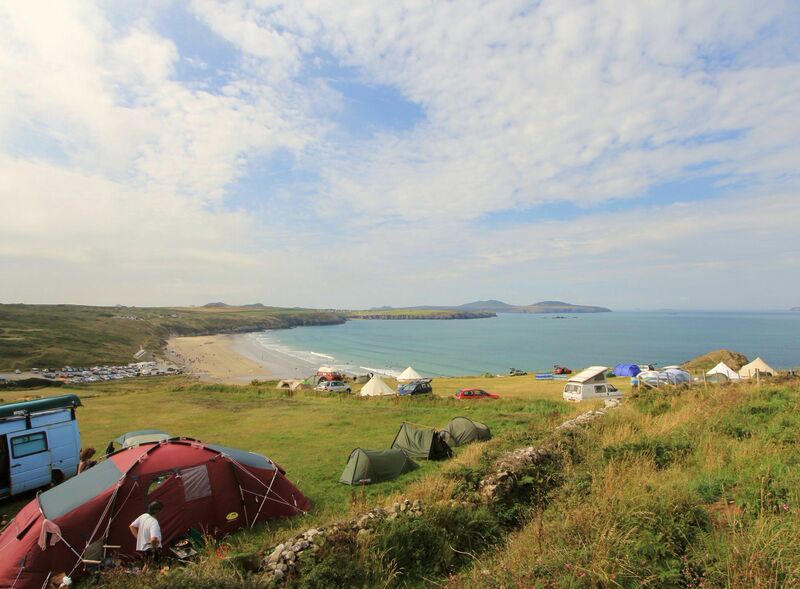 It is an outdoor lover’s paradise, so it’s no surprise that Pembrokeshire campsites rank among the best in the UK too. Travel writers lavish near constant praise on this beautiful part of west Wales and, of course, it’s our opinion that the best way to visit it is on a camping or glamping holiday where the great outdoors is the star of the show. With stunning beaches and glorious countryside, Pembrokeshire is true camping country and there’s a wealth of sites to choose from. 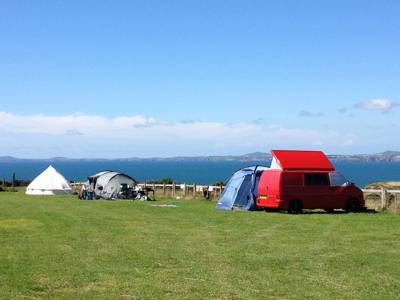 Our pick of the best campsites in Pembrokeshire are shown on this page and range from basic campsites where you can pitch your own tent in a beautiful beachside location to ultra-luxurious glamping sites where you can expect fluffy towels and private hot tubs. There are fantastic family-friendly sites and places that are perfect for a pair on a romantic retreat too. 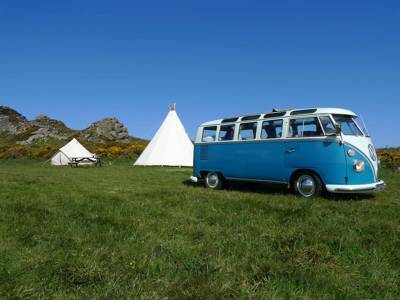 The beauty of classic camping in Pembrokeshire is its simplicity. When you’re tucked up in your canvas cocoon there’s just a zip separating you from all the natural splendour that has won Pembrokeshire so many accolades. The Pembrokeshire Coast National Park dominates the coast and there are lots of amazing campsites right on the beach where you can enjoy a sea view and the taste of salty air. But in Pembrokeshire you’re never far from the sea and you can still make the most of the coast if you prefer to stay inland too: wildflower meadows, working farms and enchanting woodlands all play host to some of Pembrokeshire’s best camping sites. Whether you are hiking on the Pembrokeshire Coast Path and want somewhere to pitch up that’s not too far from the route or you're looking for somewhere that’s suitable for a two-week holiday with the family, the Cool Camping selection should have a site to suit you and let you explore everything Pembrokeshire has to offer. If it’s luxury that matters most, you may want to pay more attention to the carefully-selected Pembrokeshire glamping sites that are featured in our collection. There’s a great range of glamping sites across the region, offering luxury camping for those who prefer a little more comfort in camp. Almost every conceivable type of glamping accommodation is available in west Wales from treehouses to tipis, and from modern geodesic domes to old-fashioned gypsy caravans. There are shepherd’s huts and gleaming Airstreams as well as bell tents, yurts, safari tents and more. The level of luxury varies depending on the site you choose and the luxury tent, cabin or caravan you go for. Some places pop-up for the summer and simply save you the hassle of putting up a tent while others are more permanent fixtures with a little more sturdiness, sumptuous bedding and indulgent extras. Glamping can be a great way to holiday with the whole family – offering a compromise between the great outdoors and the great indoors. If some of the family are classic campers with a taste for the simpler things in life while others like a few home comforts, what could be better than glamping? In addition, a lot of glamping accommodation offers a bit more space and a lot more charm than your average tent. Kids will love the pint-sized proportions of some of these tiny homes with their cabin-style beds, miniature equipment and clever fold-aways. But whether you’re glamper or a camper you’ll find somewhere to suit you for family camping in Pembrokeshire. Most sites are family friendly and many even let you bring the dog. There are loads of great family-friendly days out in Pembrokeshire, too, from the free entertainment of a day on the beach to taking part in adventure activities such as coasteering, climbing and horse riding. 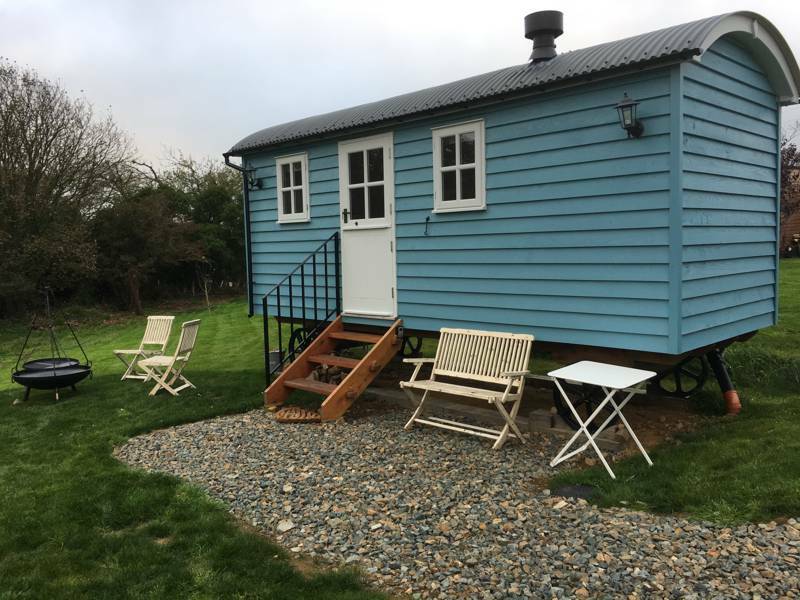 If you are looking to get away on a glamping holiday for two in Pembrokeshire, look out for places with secluded pitches and glamping accommodation that is set apart with plenty of space. You might also like to consider taking a mid-week break or a trip outside of the school holiday season, allowing you to start exploring Pembrokeshire at the quietest time. Camping and glamping sites tend to be quieter mid-week, so it’s a great time to visit if you are looking for a bit of time out and seclusion. Visiting outside of peak times can also give you the chance to explore the popular spots with less people around, making those awesome walks on the coast even more enjoyable. Autumn and winter camping and glamping can be a really romantic experience as the cooler weather means you’ll be keen to cosy up around the campfire. It’s also when glamping comes in to its own: extending the camping season and offering snug getaways surrounded by nature. There’s not much more romantic, in our opinion anyway, than candlelight, campfires and cosy cabins. The Pembrokeshire Coast National Park accounts for much of this special region and beautiful beaches like Barafundle Bay are a big draw but there’s much more to this protected landscape than sea, sand and shingle. The national park stretches 240 square miles over most of Pembrokeshire and, in addition to the wide sandy beaches in Pembrokeshire, you’ll find rocky coves and impressive limestone cliffs. A great way to see some of the most stunning coastal areas is to join the Pembrokeshire Coastal Path which stretches 186 miles along the protected coastline. There are of course, plenty of other adrenaline-inducing ways to appreciate the coastline too – including climbing, coasteering and kayaking. The national park is also home to the wildlife haven of the Daugleddau Estuary and the Preseli Mountains (or hills), a limestone outcrop among moors and grassland. This part of the national park offers great walks and even better views: on a clear day from its highest peaks (536 metres) you can see all the way to Ireland and Snowdon. The national park also has some fascinating market and harbour towns within its boundaries which are well worth a visit – including the UK’s smallest city, St David’s (population 1,600). You won’t be short of things to do in Pembrokeshire: in fact there’s so much going on you may find it hard to know where to start. To give you a helping hand we’ve put together this handy Cool Camping list of ten things to do in Pembrokeshire. The Pembrokeshire Coast Path runs 186 miles along the entire Pembrokeshire coastline from St Dogmaels in the north to Amroth in the south. 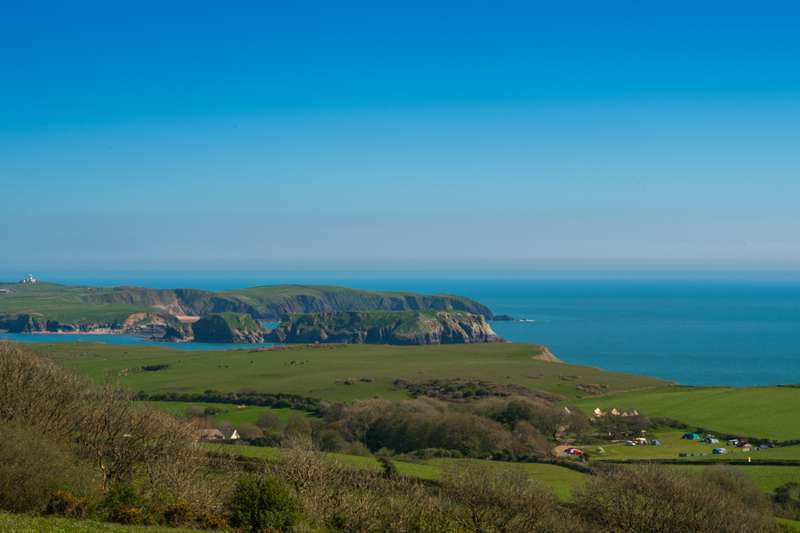 You may not want to tackle the whole route whilst glamping in Pembrokeshire but why not take a picnic and tackle a short section to see some spectacular coastal scenery? It was Wales’ first national trail and falls almost entirely within the Pembrokeshire National Park giving walkers the chance to see rare wildflowers and wildlife as well as stunning views. This combination of climbing, swimming and cliff jumping was invented in Pembrokeshire so it’s a great place to give it a go. Open to all (over eight years old) coasteering is an adrenaline-fuelled way to explore the coastline and a great activitiy for families with older children and teenagers. There are plenty of qualified and experienced coasteering activity guides who can take you for a day out on the rocks. Just as there are plenty of people to teach you the ropes of coasteering, there are plenty of opportunities to indulge in your favourite watersports or even try a new one. Whether you want to paddleboard, surf, kitesurf or kayak, you’ll find somewhere that will hire out the gear and teach you the ropes. Official tourist information provider, Visit Pembrokeshire has a handy searchable list of providers. While enjoying all that lovely coastal scenery, don’t forget about the inland beauty of the Preseli Mountains. You’ll find yourself far from the crowds if you take a hike or go for a run across heather moorland on one of the many well-marked walking trails. It’s worth making your way to Foel Eryr and some of the higher peaks for panoramic views and you may just spot some of the reminders of Bronze Age and Iron Age settlements along the way. It won’t take long to explore the city of St David’s as it is such a teeny, tiny little place. Named after the patron saint of Wales, it has a population smaller than many villages at just 1,600! It was awarded city status in 1995 thanks to the fact that it has its own cathedral built at the final resting place of St David. The 12th century cathedral has been attracting pilgrims since it was built. The Daugleddau Estuary in the middle of the Pembrokeshire Coast National Park is at the confluence of four rivers. It’s known as a great spot for birdwatching and a lovely place for a paddle in a kayak – so why not combine the two? This quiet way to ply the waterways leaves the wildlife undisturbed so it’s a great way to get up close to some of the interesting birds and animals. There are more wildlife watching opportunities offered by taking a boat trip out to sea. All along the coast there are companies offering wildlife watching trips to see seals, dolphins and porpoises. Book in for a trip with one of them and you also get a closer look at the populations of seabirds who make their home on Pembrokeshire’s cliffs and, if you’re really lucky, you might just catch sight of a blue whale. The islands of this stretch of wild Welsh coastline are a haven for wildlife and heaven for wildlife watchers. Head for Skomer Island, just a mile off the Pembrokeshire coast, to see the resident population of puffins and seals or take a trip to Ramsey Island. Ramsey is an RSPB reserve which is recognised as one of the best places in the UK to see wildlife. It is home to shearwaters, guillemots and choughs – among others. The quaint seaside town of Tenby is one of Pembrokeshire’s best-known and best-loved towns and has been attracting holidaymakers for centuries. Its town walls surround cobbled streets that will have you reaching for the camera at every turn. It has a historic harbour and a choice of three sandy beaches with tea rooms, cafes, pubs and gift shops to browse within its historic heart. Pembrokeshire camping campsites glamping glampsites sites at Campsites in Pembrokeshire, Looking for a Pembrokeshire campsite? Find the best ones here with recommendations from the expert authors behind the Cool Camping guidebooks, including seaside campsites, dog-friendly campsites, tent-only campsites and campsites where your campervan is welcome too.